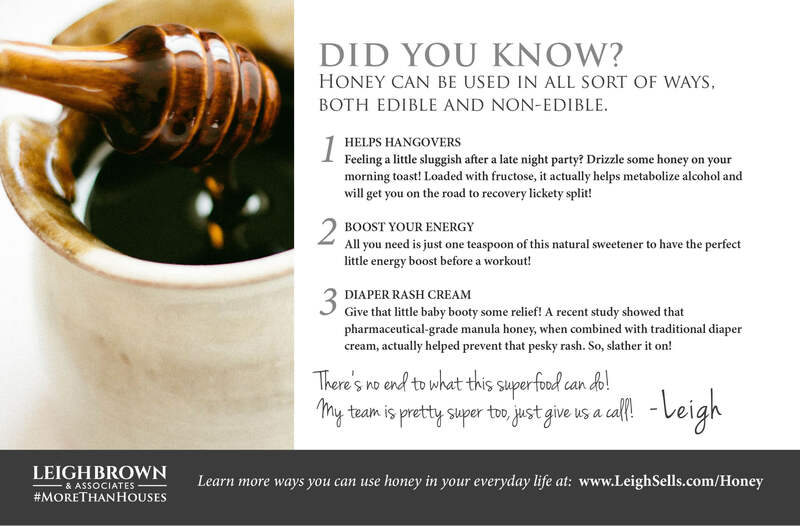 Honey maintains moisture naturally, making it an ideal substance to use on your face. Just cover your face in a thin layer and leave on as long as you like. Rinse with warm water (don’t let Fido lick it off) and feel the difference! Honey actually kills bacteria and reduces healing time, just ask the Ancient Egyptians! A great reason to add a little jar to your First Aid Kit! Mixing two parts honey and 1 part cinnamon helps get your metabolism going and aids in digestion. Think of it as the 1-2 punch when trying to lose weight! Do not let that nagging cough or scratchy throat get you down! Try 2 teaspoons of honey to soothe your throat and thin out any mucus. No need for a trip to the spa, now you can remove unwanted hair yourself! Warm a mixture 1 tbsp. honey, 3 tbsp. brown sugar, and 1 tbsp. lemon juice. Allow to cool and then apply to area with a popsicle stick. Press a piece of muslin firmly onto the area, wait 5 seconds, and quickly (did I say quickly?) remove the muslin! Ouila! Clean as a whistle. Many find relief from seasonal allergies by taking a few teaspoons of local honey each day. The pollen in the honey builds up an immunity to the pollen in the air… like an allergy shot, but much tastier and without a needle! Do not let chronic halitosis get you down! Prepare this mixture and you will be ready for your next face-to-face meeting. Combine ¼ C water, 1 tsp honey, and 1 tsp lemon juice. Gargle for 3 minutes and you are set with fresh breath for the day!